Last November, Colleen and I offered a Craft Beer Tasting in the fund raising auction for our son's school. Due to varying schedule conflicts, the event had been postponed several times. However, we were finally able to do the presentation Saturday evening. We loaded up our car with coolers of beer, food, glasses, and serving dishes and utensils for the tasting held at the winning bidder's home. The winning bidders had also been previously given a selection of 6 different beer glasses and the book "The Brewmaster's Table" by Garrett Oliver. The original offer was a tasting of 6-8 beers, along with food pairings, for 6 people. 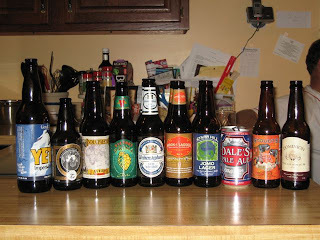 Narrowing down the beer selection, while still demonstrating variety, proved difficult. We ended up presenting 11 beers. Russian Imperial Stout served with vanilla ice cream as a "float"
We began with a brief introduction to craft beer in general. I talked about enjoying all aspects of the beer; appearance, aromas, flavors, and aftertaste. Each participant was given a menu listing the beers and the foods to be served with each, along with room for notes. I was happy to see that folks took lots of notes on the beers. Most of the attendees had some familiarity with craft beer, and I believe everyone found something new to enjoy. We then spent almost three hours working our way through the beers. We served 4 - 6 ounce samples of each beer, along with a small dish of each food. As I discussed each beer, Colleen was busy serving up the foods for each course. Not only did she do a masterful job of preparing the plates, she also cleaned the dishes from the previous course. All of the food was enjoyed as much as the beers were. Except for the Dominion Barleywine, most of the beers selected are available locally at this time of year. I couldn't find any barelywine in local retailers, so I pulled some bottles from my "cellar." Unfortunately the Yeti stout (indeed all Great Divide beers) is no longer being shipped to Virginia, but a local retailer still has some stock that I availed myself of. The purpose of the event was to illustrate the variety offered by beer, though the selection was heavily influenced by my own preferences. The other "promise" to the winning bidder was that they'd had beer left over to enjoy at a later date, so we left behind bottles of most of the selections. The auction winners treated everyone to a dinner of grilled steaks after the tasting. This gave us all a chance to relax a bit before heading home. Preparing for the event was a lot of work, and created some nervousness as we wondered if we'd pull it off. It turned out to be a success and everyone had a great time. Colleen and I are considering making the same donation for this year's auction. The folks attending this event did give us a warning regarding offering the event in a future auction. They jokingly told us not to be surprised if they told other folks how awful the event was, in order to keep the bidding low so they didn't have to battle others for it. I'll take that as a sign of a success. Sounds like it went well. Great job! Do you have any more pics from the event? I'd love to see more pics. Sounds like an incredible time!! Yes, it was quite an incredible time. Unfortunately we didn't take many photos, just a few pictures of the (very happy) folks participating. Next time we will concentrate on beer and food pics.